Young-OGEMID has developed a number of initiatives meant to address the unique needs of the listserve members. These include "virtual" symposia among others. Making the transition from higher education to practice can be difficult. Very often, we don't know what we don't know, leading to all types of mistakes. In this virtual symposium, senior lawyers from private practice, government and corporate legal departments share their insights on what junior lawyers should or should not do in order to succeed at their jobs. Membership of Young-OGEMID is free, there is no obligation to subscribe to the Transnational Dispute Management (TDM, ISSN 1875-4120) law journal and people can leave the list at any time. The only prerequisite is that people who register are either law student, Junior (non- tenure) Academics or associates e.g. partners or tenured professors shouldn't join as Young-OGEMID is meant for young professionals so they can exchange, relatively out of the eye of their seniors on a more equal basis, information and discussion. Kind provided by Judith Levine, Permanent Court of Arbitration (PCA). 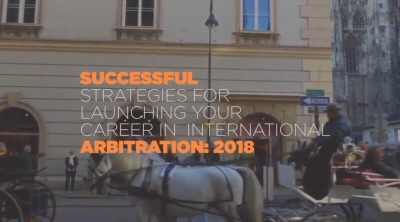 Second edition of the INOVARB-AMCHAM event "Successful Strategies for Launching your Career in International Arbitration" in Vienna, on 26 March 2018, during the Willem C. Vis International Commercial Arbitration Moot. Click on the link below to hear valuable inputs on the topic from Prof. Dr. Julian D. M. Lew QC, Prof. Dr. Stefan Kröll, Dr. Crina Baltag, Dr. Ioana Knoll-Tudor, Prof. Dr. Patricia Shaughnessy, Felipe Sperandio and Sherlin Tung.